BCA is an agency under the Singapore Government’s Min­istry of National Development and is tasked with developing green technologies to meet the goal of making 80 percent of all Singapore’s buildings green by 2030. 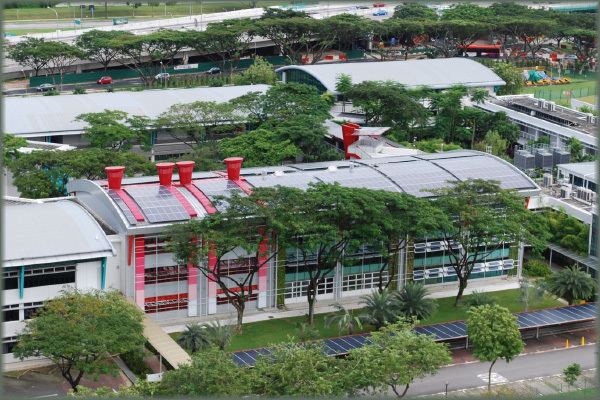 ZEB is BCA’s flagship project and the first net-zero energy building in Singapore. 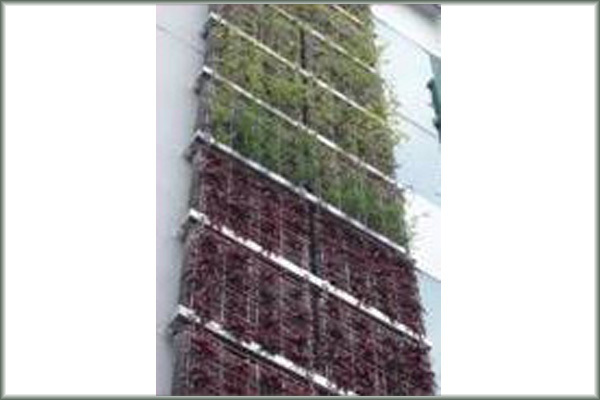 To serve as a laboratory for the integration of green build­ing technologies in existing buildings. To meet the zero energy goal, the design team adopted an integrated design approach that focused on two general principles to reduce energy consumption: passive and active design strategies. 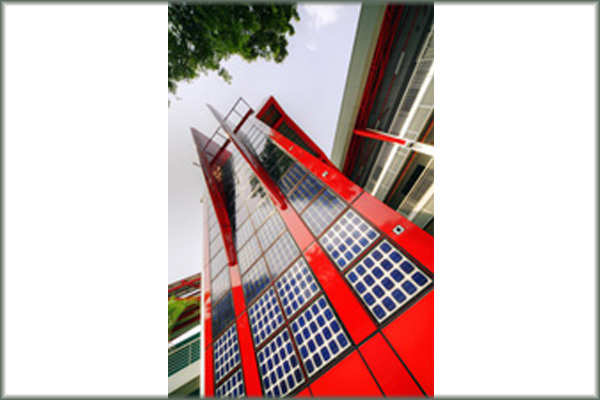 Photovoltaic glass has dual functions of providing shading and generating power at the same time. Re­searchers are monitoring it to determine its efficiency, impact on views to the outdoors, shading, heat absorp­tion and re-radiation. Double-glazed units (DGU) with internal operable glass are being studied for their impact on views, shad­ing and heat absorption. DGUs are made up of a glazing system with blinds between the panes that adjust ac­cording to incident sunlight. Air between the double panes is thoroughly dried and the space is sealed air-tight, providing superior insulating properties and eliminating possible condensa­tion. Double-glazing surrounds all air-conditioned areas, with single glazing installed in the classrooms and school hall. Daylight enters deep into the space reducing the amount of artificial lighting required. 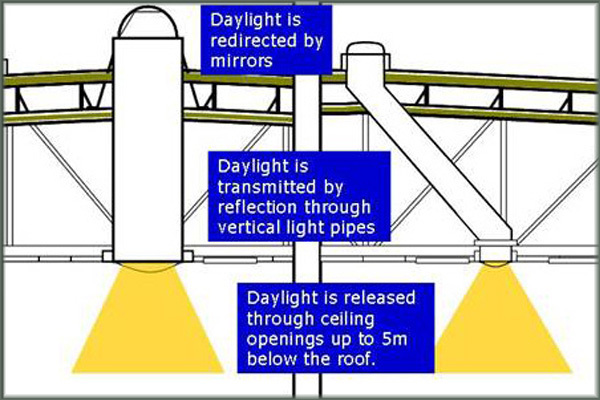 Light shelves have highly reflective surfaces that reflect daylight deeper into the building. Externally mounted on the façade, they also provide shading against direct sunlight. 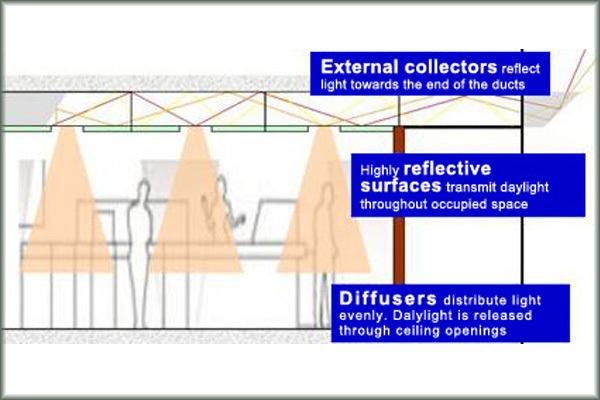 Efficiency of the light shelves is enhanced through ceilings that have highly reflective coatings. Over 40 percent of energy consumed in a typical office can be attributed to air conditioning. 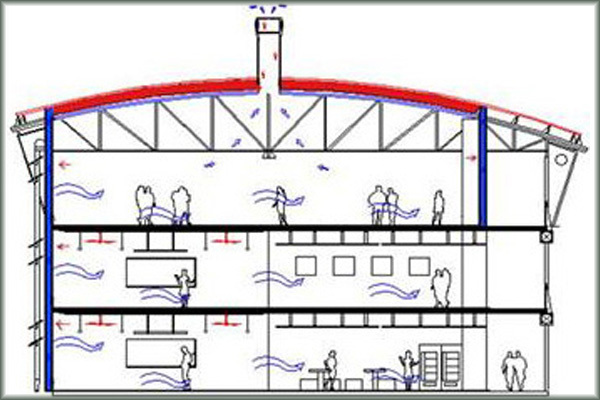 Natural ventilation at ZEB helps reduce the air condition­ing load. Roof-mounted solar panels assist in ZEB’s ventilation system. Heat builds up in the 300-millimeter (12-inch) gap between the solar panels and the metal roof creating a nega­tive pressure area as warmed air rises. 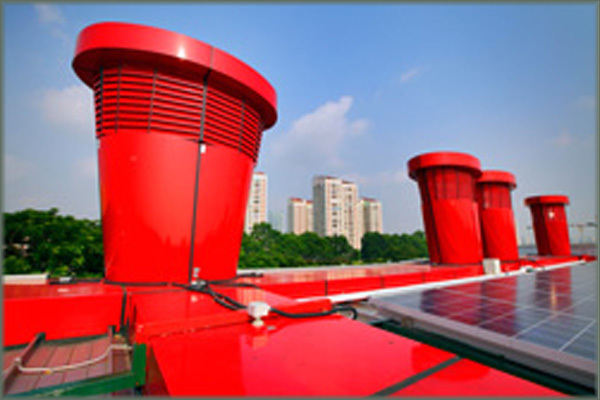 Due to the buoyancy effect, when heat is removed from the gap, warm air from inside the building is drawn up towards ceiling vents and out through the four solar chimneys. Mirror ducts capture ze­nith daylight (which is brighter than lateral daylight) through external collectors. The light is channelled into horizontal reflective ducts within the false ceiling. Daylight harvested from mirror ducts is usually glare-free and the technology in­volves no mechanical parts and requires no power. Light pipes are essentially pipes that stick out of a build­ing’s roof and direct sunlight into interior rooms. They are more energy efficient than skylights because less energy es­capes due to reduced surface area. Two types of light pipes are in use at ZEB—one that is equipped with rotating mirror and one without. Use of fluorescent lamps cut power us­age by 26 percent. 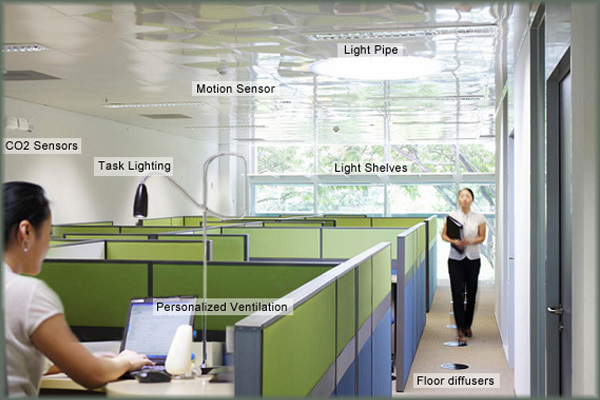 Occupancy sensors control the amount of artificial lighting used. Lights are activated only when someone enters a room. Additionally, light intensity is adjusted according to daylight­ levels. When there is abundant daylight, artificial lights are automatically dimmed. 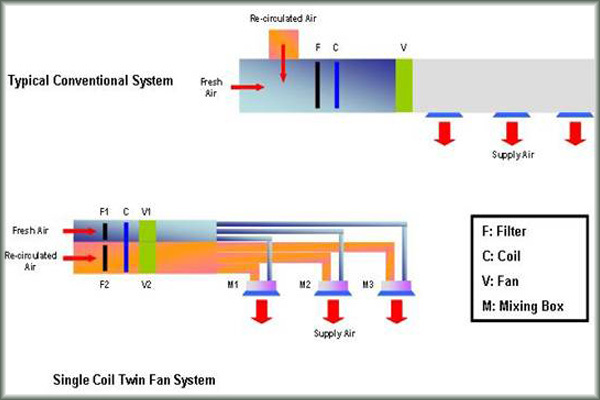 Energy-efficient air-conditioning: The system detects carbon dioxide levels and lowers fan speed, and thereby ventilation rates, when fewer people are around. Floor diffusers: These supply cool air, which, once warm, will rise toward vents in the ceiling and exit the building. 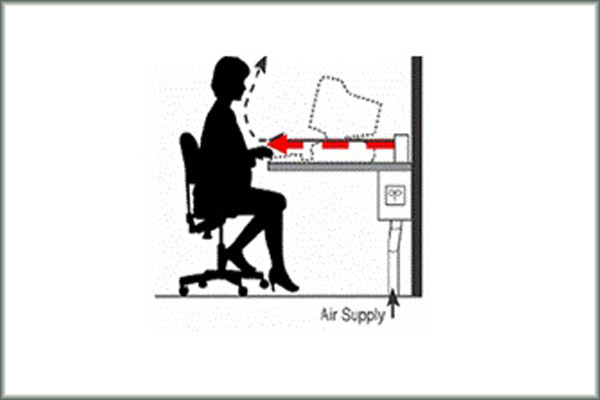 Personalized ventilation: Cooling supply around each desk is adjustable according to individual needs. About 1,540 m2 of roof- and façade-mounted photovoltaic panels, connected to grid, generate about 207,000 kWh per year. Surplus power generated by the panels is distributed to other BCA academy buildings and supplied to the grid if any is still unused. If insufficient electricity is produced by the solar panels, balance is taken from the grid supply. Over the course of a year, the solar panels generate more energy than required by BCA ZEB.